Consistency is the Bavaria secret. This sizeable vessel still handles with the agility of a ski boat. The lounge adjacent to the helm (above) keeps the skipper in good company. The saloon features a fully functional galley. You can dine with the captain at the alfresco cockpit table. Computerised construction methods ensure a level of consistency and quality in all areas of the boat from stern to bow. I’ve tested a lot of Bavaria Sport Boats over the years, but it wasn’t until recently that I realised just how big the Bavaria operation was. It must be close to being the biggest boat builder in the world. The company’s massive turnover has allowed it to spend billions of Euros automating much of the construction process used to build these boats. Some will argue that a totally handmade boat is better, but I defy any craftsman to consistently keep his tolerances to 1mm throughout any job. It’s not humanly possible. This is the realm of computer-aided design (CAD) and multi-axis cutting machines that can turn out thousands of precise, identical parts. And when all the various parts that form that ‘new boat jigsaw’ come together, you can be assured that every boat’s construction and quality control is spot-on. The ability to do this consistently also stops wastage and down time, keeping the price down. But this is not the only reason Bavaria Sports Boats are so popular right around the world. 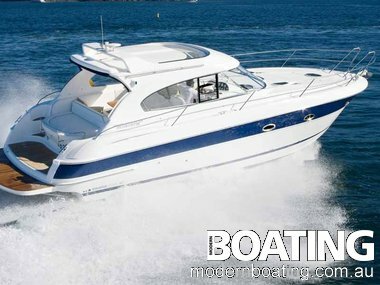 Bavaria has always offered boaties clever, user-friendly designs and layouts in tough boats. So tough in fact, this boat is rated to Gale Force 8, which means it’s capable of withstanding 40 knot winds and seas more than 5m. Twin 5.7L Volvo Penta GXI 320hp petrol engines, driving through DPS Duo-pro legs, power this almost 10,000kg vessel (full load) to 34 knots at 4900rpm. But I reckon that once the engines are run in for a few more hours, and with a bit more trim tab, 36 knots is within reach. But who cares anyway ? The 37HT is a well designed, user-friendly family cruiser that can sleep six and confidently tackle offshore passages. And as most boaties know, we seldom travel at 36 knots offshore, especially with fuel prices as high as they are, but it’s nice to know she can do it. By dropping her cruise speed back to 22 knots, not only will the ride be a lot softer, but you won’t need the bank manager’s consent when you fill her up. Her fuel consumption drops dramatically to only 30L per side, per hour. At that speed a trip from Sydney to Port Stephens will take around 3.5 hours and you’ll still have teeth when you get there. At 39ft 2in overall, the Bavaria Sports Boat 37HT is a sizeable boat, but surprisingly she still handles like a ski boat. Throwing her into full-lock turns at wide open throttle doesn’t faze her. The 37HT’s deep forefoot and sharp bow-entry make short work of chop and swells and her aggressive chines deliver a soft, dry ride and keep her stable under power and at rest. If I was to use one word to describe the 37HT it would be ‘forgiving’. Even an inept boatie would have to make an effort to get into trouble in this boat. The sea-handling characteristics are superb, she’ll compensate for most skipper blunders and will give a new boatie confidence to gain experience and enjoy their boating. Most families would enjoy a weekend away on this stylish cruiser. Even though she’s almost 40ft long, she’s as easy to handle as the family car and offers all the comforts of home. The 37 Hard Top is a true all weather boat. I am not a fan of air-conditioning, so when it gets hot I like to open the windows and let the breeze flow through and that’s easy on the 37HT. Opening side windows gives the skipper and navigator good cross-flow ventilation, or you can open the electrically-operated roof with the push of a button and bring the outdoors, indoors. The cockpit area is where boaties spend most of their time and why wouldn’t they. It features a single-level self-draining design; wrap-around lounges near the helm, so more people can sit with the skipper; a U-shaped lounge and alfresco dining table; barbecue/sink unit; and areversible transom lounge and engine-bay cover that converts into a huge sun pad. Plus, except for the sun pad, it all falls under the protection of the hard top, so you can escape the harsh Aussie sun. Let’s go back to the engine bay for a minute. It’s huge. So large, the twin 5.7L Volvo V8s are dwarfed in it. Daily fluid checks and regular maintenance is a breeze. This bay is so deep it allows a massive storage tray to fit above the engines when the hatch is closed. It’s the ideal place to store wet items such as fenders, dive gear and the likes. Stepping down into the main saloon is like entering a compact yet, luxurious apartment. It features a fully functional galley, plenty of comfortable lounge seating for a family, which converts into an additional double bed and a bathroom and shower that can accommodate boaties of all sizes. The owner’s cabin features a large island bed with plenty of hanging lockers and under bed storage, but its coup de grace is that it’s behind a solid bulkhead (with a door for privacy), which seals it off from the rest of the boat. The amidships cabin has standing head-height and a lounge on the port side, hanging lockers, twin berths and, more importantly, excellent cross-flow ventilation. With a base price of around $400,000 for a family boat that’s almost 40ft long, this has to be one of the best buys around for an express cruiser. The Bavaria Sport 37HT is also available with the latest Mercury Axius system. Using computer commands to control each sterndrive leg individually, Axius allows the user to effortlessly move the boat in any direction for docking and close-quarter manoeuvring using a simple joystick. It adds about $30,000 to the overall cost, but anyone buying a boat with sterndrives would be crazy not to spend the extra money for the convenience. Axius turns novices into pros within minutes and it stops pros dinging the gelcoat when tide and wind work against them. Twin 5.7L V8 Volvo Penta GXI 320hp petrol engines, driving through DPS-Duo props. In calm conditions on Sydney Harbour the 37HT returned the following speed-to-rpm figures.